Man Zone - THE place for man cave purchases & gift ideas! A great value memento for a die-hard footy fan – or the perfect gift for one that you know! In our 30 year journey, the West Coast Eagles Football Club understands and appreciates the contribution of everyone involved, at so many levels, and in so many ways. Most importantly, though, we recognise and salute our players – all of them. As part of our 30 year celebration, we are proud to release the ultimate team photo - simply titled ‘We Are The Eagles’. Given our Club’s core beliefs of mateship and unity, the image represents them seated as one team! This is a truly iconic image for our Club. All of our great champions are there, of course, but they are together with the boys who only played one or two games. Limited to 500 editions worldwide, presented in a deluxe timber frame and officially licensed by the Australian Football League, this product is a must have for Eagles fans and astute collectors alike. Relive the past glories of the Eagles – or surprise your favourite die-hard West Coast fan! Features both action images of the stars in full flight, and celebration images from West Coast's 2006 Premiership. This stunning framed piece celebrates the amazing West Coast and its 2016 season. Including their 2016 team photo, along with the club's 2016 playing fixture, with the names of each of the players listed below. This is perfect for any true West Coast Football Club fan wanting to own a piece of Eagles history. A great value must-have for a die-hard footy fan – or the perfect gift for one that you know! 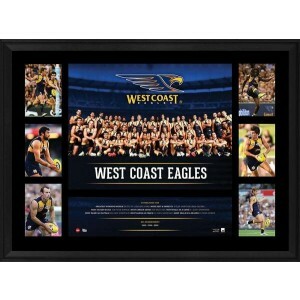 This stunning framed piece celebrates West Coast's AFL Premiership wins over the club's history. Including their 2016 team photo, along with imagery of the team's star players, this is perfect for any fan wanting to remember the club's past glories, with the premierships and club records listed. This is perfect for any true West Coast Football Club fan wanting to own a piece of Eagles' history. Please note: this is a concept image and the final images used in the product may very slightly. Josh Kennedy has quickly become the heart and soul of this young West Coast Eagles outfit. Using a combination of supremely accurate goal kicking – highlighted by an extremely unorthodox runup – and his ability to pluck huge pack marks to evolve into one of the most fearsome forwards in the competition. Couple this with surpassing club great Peter Sumich to become the Eagles' all-time leader goal kicker, his six club leading goal-kicker awards and his three All-Australian selections, you can see why Kennedy is so greatly admired by the West Coast Eagles faithful. Man Zone is a family owned and operated online store established by Mark & Vanessa Stelfox, located in Wodonga, North East Victoria. Man Zone specialises in official licensed products, unique man cave gifts, man cave furniture, décor and lots of other stuff any bloke would be proud to display in his Man Zone including memorabilia, barware, collectables and gaming tables and other unique items. We source our stock from reputable wholesalers throughout Australia and overseas, as well supporting ‘local’ entrepreneurs from the region who share their passion for making a Man Zone a great place to hang out. © 2015 Man Zone. All Rights Reserved.